‘Reduce, reuse, recycle” — this catchy environmental mantra has become familiar to most of us. What’s not as familiar is the variety of space-saving storage solutions designed to make those three R’s easier to integrate into your household routine. Recycling containers have tended to be unattractive space hogs that belonged outdoors or in the garage. So in too many households, recyclable materials are often tossed in the trash simply because it isn’t convenient to recycle them. Fortunately the newest home recycling systems are refreshingly streamlined and decor-friendly. From a high-tech compactor for recyclables to basic bag dispensers, there are now dozens of environmentally conscious containers and systems to choose from. Designed by BMW Designworks, the upscale Ecopod Recycling Center ($324; (888) 436-8940; peoplepoweredmachines.com) is a clever “compaction and collection system” that is actually fun to use. 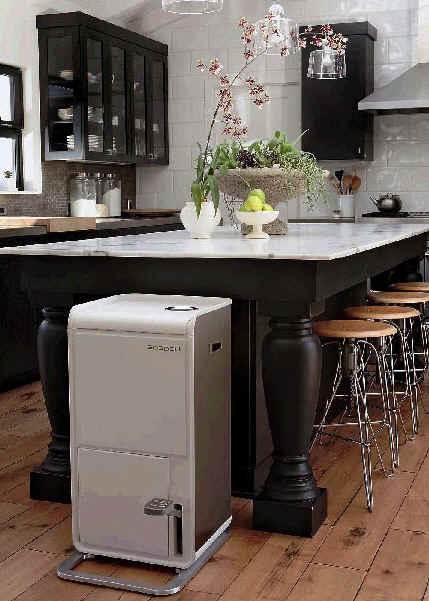 Measuring 31 inches tall by 16 inches wide by 21 inches deep and built of brushed stainless steel and plastic (available in white or black), the unit resembles a free-standing trash compactor but has a specially patented foot-pedal (the “ecostep”) in front and a circular opening on the top. You drop an aluminum can or plastic bottle (up to 24 fluid ounces) in the top opening, press the ecostep for compaction, and the freshly crushed recyclable automatically falls into the enclosed collection bin (or “pod”) which holds up to 50 compacted cans or bottles. To empty it, just open the door in front and slide out the pod. Inside the Recycling Center’s top lid are two more removable pods for glass, paper or other recyclable items. At first glance, the 9.5-gallon Step-On Sorter ($40; The Container Store, Fashion Valley mall; (619) 220-0909; container-store.com) looks like a wide step-can (17 inches wide by 14 1/2 inches deep by 15 1/4 high). But the smooth white plastic lid conceals a surprise: two sections that can be adjusted to make one compartment larger than the other. You can use the Sorter to hold trash in one section and recyclables in the other: or if you’re sorting your recyclables and use more cans and fewer glass containers, simply adjust the divider to customize the compartments. Locking closures keep the specially sized 7-gallon plastic bags in place (sold separately; $4 for 40). 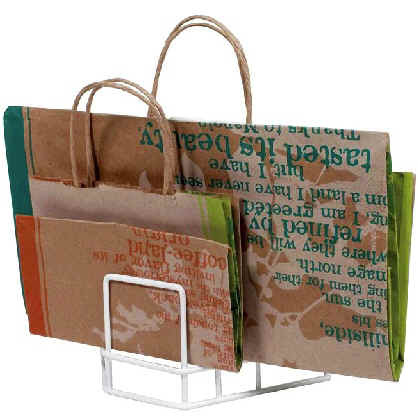 For under-sink convenience, The Container Store also offers the Wire Pull-Out Recycling Basket ($40), designed to use paper grocery sacks or 10-gallon plastic bags (sold separately; $3 for 15) as a liner. Made of white vinyl-coated wire, the basket (13 5/8 inches by 81/2 inches by 15 1/2 inches high) holds up to 50 pounds and has a solid bottom tray to prevent leaks from escaping. The unit mounts either side-to-side or front-to-back under your sink to accommodate plumbing. The Grocery Bag Caddy ($10; (888) 940-0605; Dynamic-Living.com) turnsplastic grocery bags into disposable containers for garbage or recycling. Made to mount inside a cabinet door or on a wall, the black plastic frame (11 1/2 inches wide by 6 inches high by 6 inches deep) holds handled plastic bags that are at least 11 inches wide. A stainless steel flip-top lid covers the bag opening to help keep odors contained. 3 3/4 inches deep) holds up to 30 bags. The counter-top caddy, which also fits nicely inside a cabinet, holds up to 50 bags and measures 12 inches high by 4 4/5 inches wide by 11 1/4 inches deep. 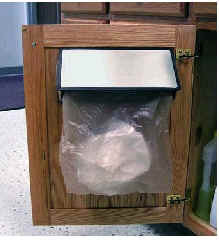 For recycling paper supermarket and department store shopping bags, Organize.com also offers the Paper Bag Holder ($6.49), a white plastic-coated wire holder (9 1/2 inches high by 9 1/2 inches wide) that mounts inside a cabinet door and has a three-tier design to accommodate 25 bags of almost any size.